Washburn adds to its resonator guitar line the R360K Parlor-type, a model that debuted at NAMM 2014. 01/20/14 in Gretsch G9231 Bobtail Steel Square-Neck A.E. Gretsch adds four new models to its range of Roots Collection resonators guitars. 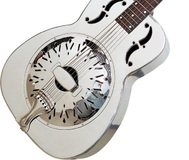 With the Reso-Tele resonator guitar, Fender gives a new look to a classical instrument. The Grestch G9240 Alligator Biscuit Roundneck resonator guitar joins in 2013 the Roots Collection. Fender presents its new FR-55 Hawaiian Resonator guitar. 02/08/12 in Gretsch G9220 Bobtail Round Neck A.E. Gretsch introduces its Roots Collection of acoustic instruments. Washburn Guitars announces the addition of the Resonator Series to their line of Folk/Bluegrass instruments. The successful Vintage line of resonator guitars has introduced a new member, the VRC800AMF.